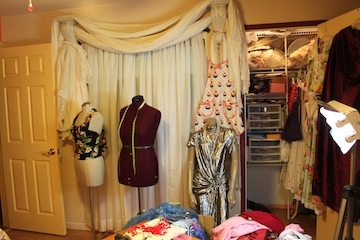 Design your own clothes, and use your closets as a fabric store. When you design your own clothes from things you already own, you get professional hems, buttons, ruffles, sleeves, pleats, cuffs, and all the labor and time that went into it. Here are some other great reasons to consider designing your own clothes, using things you already own. *New Wardrobe with little or no money out of pocket. *Total creativity to cut and paste your clothes. *Freedom to throw it away, give it away, or sell it. *Freedom to fail, without guilt (no $ investment). *Saving the environment by redesigning your clothes. *Less time or desire to snack on junk food, when creating. *Rewarding-When you wear something you made from nothing. *Therapeutic if you let it be. Even ripping out mistakes. *Income producing. Many careers, jobs & business's are supported by skilled sewing enthusiasts. *Easy to learn. All you need is patience and review of the pages right here on RetroSewing. *Design your own clothes and have a blast in the process. This is my sewing room view when sitting at my sewing machine. The closet on the right, door on the left, dress forms in the middle. When I design my own clothes, or redesign clothes I already own, I first like to take inventory. On the floor in front of the dress forms, are 3 garbage bags of clothes I've saved, or took out of my closet to redesign. Also things from family members I couldn't bring myself to get rid of. My sisters graduation gown (red silky), for instance. Lots of fabric there. This is not counting the other bag full of curtains and sheets I've collected for future projects. Basic Sewing Skills - If you are a beginner, and have never done any sewing, you may want to start with some of the free 5 minute sewing lessons (tutorials) on the "Sewing Lessons" page. There is a mix of teachers and sewing styles. You can learn how to thread a sewing machine, prepare and lay out fabric,pin, cut, put in elastic, etc You can still design your own clothes with some more basic designs. Templates to cut out new designs - You may want to cut a new neckline in your next design, so using a neckline from an old pattern or any item of clothing that you want to duplicate, could work as a template (see "Moms Blouse" on "Sewing Projects" for more details and photos on this technique). Optional - A Dress Form, Mannequin, or friend. When designing clothes you need to see what your new designs will look like, so ideally, it's easiest to put it on a dress form (close to your size),so you can work on it freely. If you don't have one, Don't let this stop you! 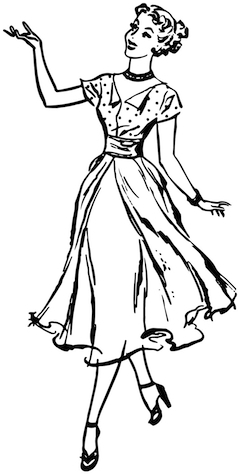 Watch updates for how to make a dress form at home. If you don't have a dress form, then trying things on in the mirror will work. You may need help from a friend on pinning hems and such. Make sure it's a creative, helpful friend with an open mind. If she/he sews, even better yet. Still go forward, no matter what you have. These tools will make it easier if you want to get serious about this, but for now, keep going. Look for anything made of fabric that you don't use anymore,and that you can safely put in your sewing machine. Even if you don't like it, you may need it to line a garment or as structure under a garment. Clothes you no longer wear - Do you like something about it? The fabric, buttons, ruffles, neckline, anything, even though it may not fit or you just don't wear it. If so, put it into the "Design Your Own Clothes" container. Don't forget about bras and slips too. Hooks and linings good for all kinds of things. Sheets- Do they fit any beds in the house? Do you love the fabric, or just want to use them to practice design ideas (free fabric). I even used the fitted sheet, on my sheet dress. All that professional gathering from the sheet corner went right into the waist of the skirt see "Sheet Dress" in "Sewing Projects" for details. If you absolutely can't consider changing or getting rid of something sentimental, or it's just too beautiful to take a chance on ruining, then do what you must, but move forward. When something is so beautiful as it is, but I just can't wear it, I can't bring myself to cut it, so i'll give it away, sell it, or use as art and decoration. Don't let every item freeze you into indecision, and delay the best part. When you design your own clothes, make sure you are in the right frame of mind. This is NOT a miserable moment of "I hate cleaning out my closet". This is an exciting moment and your designing your own clothes. Remind yourself that this is all free stuff. You already paid for it, and are ready to make good use of it. More importantly you'll have a whole new wardrobe, without spending a scent, and remember, if you mess it up, it's ok. If you can't live with that, then consider another alternative for that piece, but don't let the fear creep into a reason everything does not work. Let's get started. It can be overwhelming when you design your own clothes, if you have a lot of stuff to go through. I had about 4 large containers, as you can see in the photo. I came up with a system that helped me get this project into bite size steps. Here they are. a. Start with the "Design your own Clothes" container first, putting the other containers aside for now. Find a place you can lay things out for a few days, and contemplate and experiment with the possibilities. b. 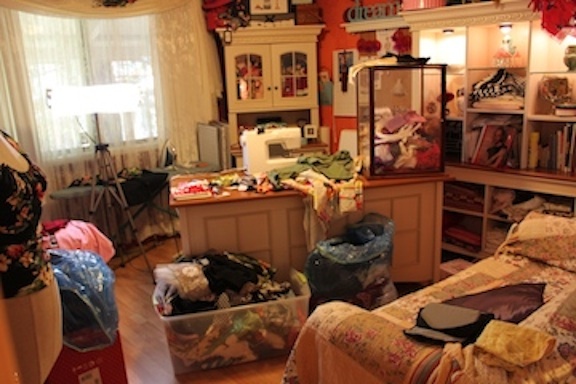 On a large table or clean floor, spread out the contents of the "Design My Own Clothes" container. c. Separate into piles according to fabric type. Put all the 100% cottons together, the cotton blends together, linens together, silk, etc. Ideally like for like. Cottons with cottons, satins with satins, etc. The main thing is that the fabric washes well together, and they are similar in weight and content. d. Next organize the piles best you can. If this kind of creativity is a bit new to you, then just know you are NOT going to make any decisions until you're ready. No pressure, just have fun and let go. This is not a dangerous sport. Your designing your own clothes remember. Next, start combining fabrics and pattern pieces from your old patterns. Here are the some of the questions to ask yourself when redesigning. 1. What do I like about this as it is? 2. Why have I not worn it before? 3. Will I ever wear it again? 5. What are the chances I would wear the new design. 6. Look at each element of the item. Which is your favorite? Love the ruffles on the sleeves, but you'll never wear it again, then put it aside for a potential first design. 1	Old dresses-If stained or too short, consider adding a coordinating piece of fabric to the hemline or stain, or consider cutting the skirt part of the dress away from the top part of the dress. Then make two coordinating pieces, or completely two seperate pieces, use the fabric to make something completely different. Pillows, summer blouse, skirt, to name a few. 2. Old Blouse - If the top won't work as it is, then consider inlaying fabric into the top, to take advantage of the buttons, pleats or ruffles.See "Moms Blouse" on "Sewing Projects" page for one example. 3. Free Fabric. Old sheets, table cloths, napkins, pillow cases, etc can be used as raw fabric. 4. Once you've tried out some ideas, and think you've got something worth going the next step, your ready to start assembling your design. Go to "Sewing Projects" for examples and descriptions, and photos of clothes I'm designing from old clothes, and other things I find around the house. 1. When you design your own clothes, lay out the pieces you are considering working with. Wash according to instructions (only if never washed). Especially if its cotton. Any shrinking needs to be done before cutting, or you may find the garment will shrink after the fact. 2. Try, different things (check "Sewing Projects" page for ideas. Subscribe to updates for new information on the subject of design your own clothes. 3. You'll need to be very patient, when you design your own clothes. Lots of pinning, adjusting and trying on. If you have a dress form, then you'll only need to try on a couple of times. (See updates for making your own dress form). 4. When you think you're ready to start cutting and sewing, pin everything in place. Measure, mark it with washable sewing marker pin, try it on once more before cutting. 5. Lay it out, smoothing wrinkles and preparing to sew in place (use lots of pins). Use a basting stitch on most everything until your satisfied with the final try on. Then use normal stitch to reinforce. 6. Try on one final time, and adjust again if necessary. 7. Congratulations. You're done. This might be a good time to take note on how you liked redesigning your own clothes. 8. Until you've been through a few pieces, it may be tough to know how you really feel about it. Getting good at it and actually wearing the clothes and loving them will make all the difference. 9. Send your story, questions and photos for advice from me and others. Or show us how you did it and how it turned out. I have designed things I love, and things I hate, but I learn so much with everyone of the garments I do. It gets easier each time, you design your own clothes. Sometimes things I didn't think would work are the best ones, while others I had high expectations for, fall short. To design your own clothes is a fun practical goal, so have fun with it, and you'll be feeling proud of your accomplishments, and all the money you saved when you design your own clothes. Then after a few designs, splurge on some new fabric, and start a new design from scratch.